Training techniques enable strength training without the use of weights. Provides resistance along horizontal, vertical, rotational and diagonal vectors. Targets stability, mobility, strength, balance, speed and power. All boards come with 2 foot pads, 2 hand pads and 1 knee pad. 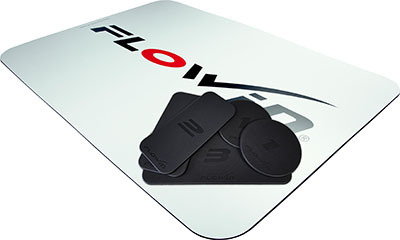 The FLOWIN® Sport Board is a non-stiff, rollable, and portable board suitable for home and travelling. 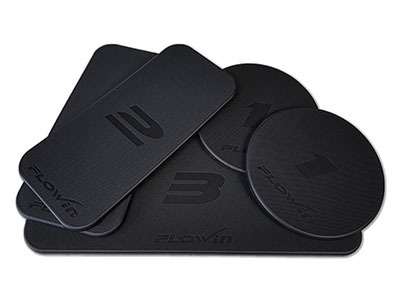 The FLOWIN® Sport Board comes in a travel case for easy transportation, and easily fits into airline overhead storage so you can bring it with you on your travels. Comes complete with board and pads as well as a personal voucher for access to workouts online. Dimensions: 55" x 3" x 40"
The FLOWIN® Pro Niveus Board is a stiff, non-foldable board suitable for use in a stationary environment such as a home, studio, or gym environment. The FLOWIN® Physio Niveus Board is developed with professionals in mind, including physiotherapists. 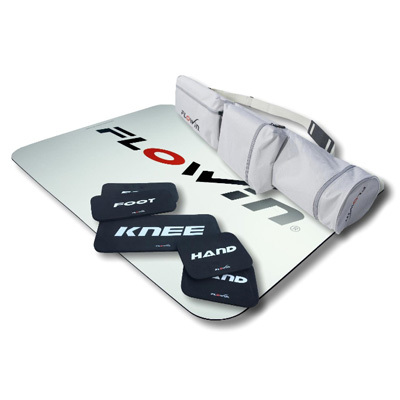 The FLOWIN® Physio Niveus Board is smaller in size than the other Flowin Boards which makes it ideal for using on a rehabilitation bench or bed, or for use in limited spaces. Dimensions: 39" x 3" x 27"